Marketing, at its core, is focused on delivering wow-worthy customer experiences—or at least it should be. From your prospect’s initial engagement with your brand on social or through a piece of content to the moment they decide to buy, it’s a marketer’s job to create killer experiences that help usher them along in their buyer’s journey. Next week, I’m cooking up three different webinars chock-full of surefire ways—from breathing new life into your social strategy to leveraging data and analytics—to engage your customers (and prospective customers) in order to boost your bottom line. Join me for one or all of these live events where I’ll be sharing actionable advice, case studies, and plenty of dad jokes about how to turn your customer’s experience into revenue. Has your web traffic slowed to more of a crawl than LA’s 405 at rush hour? This high-action, fast-paced webinar is the solution. 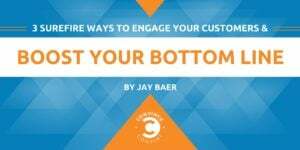 I’ll kick things off by exploring what makes customers click, share, and like on social—and then we’ll help you figure out how to turn that motivation into the right kind of messaging to drive social media traffic back to your content. I’ll be joined by Nathan Ellering of CoSchedule on Tuesday, July 25 at 2:00pm ET / 11:00am PT to discuss how you can get over 3,000% (yes, really) more traffic to your website with the help of some well-played social media moves. When you bolster your customer service, you have the capacity to elevate your revenue potential as well. Hear just how award-winning companies have already done it and different ways you can do it, too. Customers hit up to 15 touchpoints before they choose to make a purchase. If you don’t know how to meet them in those moments, closing a sale can begin to feel a little bit like a game of chance. But with cognitive technology, you can leverage insights that surface unique customer interests and overall buying habits, in order to deliver a highly personalized experience that eliminates the guesswork and lands deals. On Thursday, July 27, connect with IBM subject matter expert Anitha Gopinathan and me at 1:00pm ET / 10:00am PT as we unpack how data can help you personalize your marketing efforts to reach more customers in the right place and at the right time. Three webinars. Three ways to get your hands dirty in your customer’s buying journey. Hope to see you on one, two, or all three of these sessions (all are free, and all will be recorded for replay purposes if you register).